This is another of my favorite "Comfort Food" recipes. 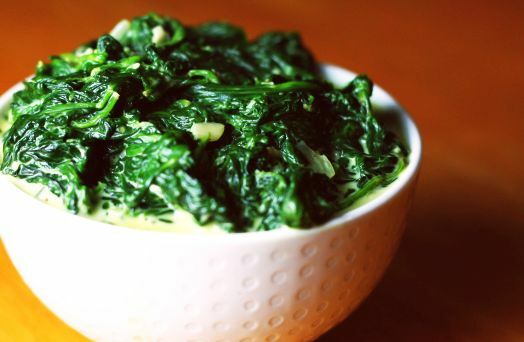 It sounds like it uses a LOT of kale, but we all know even hearty greens like kale will cook down quite a bit, especially if you use the non-curly Lacinato or 'Dinosaur' kale varieties. I prefer less sauce to kale, but if you want it more creamy/saucy then use a cup or so less kale. I really like this served simply - just plain or over toast (yes, kale on toast! ), but it's also good mixed into quinoa or pasta, over scrambled tofu, or on grilled slabs of polenta. YUM! Finely chop the kale and set it aside. Melt the margarine in a large skillet and saute the onions until starting to color. Blending the cashews smooth may take a few minutes, depending on your blender - when as smooth as possible, add soy milk, hot sauce, lemon juice, nutritional yeast, salt, garlic powder and pepper. Blend a bit longer until smooth and creamy. Add the onions and blend a little more - I don't mind if the onions are a little chunky. Now put the kale in the skillet, pour the sauce over it and simmer for about 15 minutes, stirring frequently, until kale has softened and sauce has thickened. If it's too runny, cook longer until sauce reduces more - If it starts to get too thick and kale isn't done, add another 1/4 cup water. When kale is done to your liking, remove from heat, taste and season with salt, fresh ground black pepper and/or a squeeze of lemon juice if needed. Sprinkle with vegan 'bacon' if desired, and serve. I'm always looking for new ways to try Kale, and anything creamy and spicy is a win - so I look forward to trying this. Thanks! Sounds like a winner. I have a whole bag of kale to use! Love the cashew cream idea. I even bought the new garlic/herb earth balance spread which should work great here.